CAPE CANAVERAL, Fla. – Twenty-six years after its maiden flight, NASA's space shuttle Discovery towers majestically over the launch pad at Kennedy Space Center here, just days away from embarking on its final spaceflight to the International Space Station. Discovery, the oldest of NASA's space shuttles still in operation, is scheduled to launch Feb. 24 to deliver a new storage room, humanoid robot helper and critical supplies to the space station. The orbiter has made more spaceflights than any other in the agency's fleet, and over the course of its illustrious history, its name has become synonymous with the spirit of exploration and human spaceflight. So, where did the shuttle's designation come from? NASA's ties with the intrepid Captain Cook are strong – another of his ships, the Endeavour, was the namesake for the agency's youngest shuttle. The six-astronaut crew of the shuttle Discovery's upcoming STS-133 mission plans to commemorate the ship's heritage and its historical connection to Cook with a special memento from the Royal Society in London, one of the world's oldest scientific academies. Cook went on expeditions for the society, and was elected a fellow in the 1770s. "We will be carrying a medallion from the Royal Society that was struck in honor of Captain Cook," said NASA astronaut Michael Barratt, who will work as a mission specialist on the upcoming flight. "On Cook's third voyage, there was a ship called Discovery, and that's the main ship for which our ship Discovery took its name." Discovery also took its name from a ship used by Henry Hudson in the early 1600s in Canada to explore what was eventually named Hudson Bay. Hudson sought out a hoped-for northwest passage between the Atlantic and Pacific Oceans. Since the time of Hudson and Cook, several other famous ships have been christened "Discovery," and have carried on the strong tradition of exploration. One such vessel was used by the British Royal Geographical Society on an expedition to the North Pole in 1875. "It's a culmination of a great heritage," Barratt said. "And we hope there are future ships bearing that name." 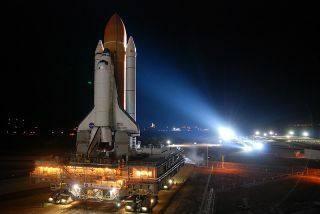 Discovery is set to blast off on its 39th and final flight, after which the workhorse orbiter will be retired, along with the rest of the agency's shuttle fleet, later this year. After 30 years of flying the shuttles, NASA is bringing its space shuttle program to a close in order to make way for a new plan aimed at sending astronauts to visit an asteroid and Mars.